I love discounts. If I see a "40 percent off" sign or a "Buy one, get one half-priced," I immediately check out the merchandise. For merchants and service providers, discounts are the best way to encourage sales and increase turnover. Discounts are the oldest tool in the salesman's book. Obvious? Yes. Simple? Not really. In membership or subscription business models, you might be surprised at how complex discounting can become. Basic discounts are a sum, or a percentage, taken off of the list price. But from what price is the discount deducted? 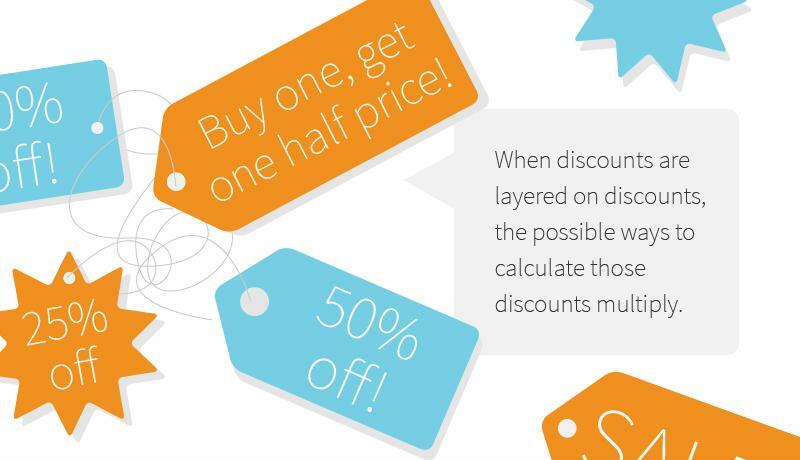 When discounts are layered on discounts, the possible ways to calculate those discounts multiply. Discounts are powerful, multifaceted tools. They can drive sales and loyalty, and they're highly sought after by customers. This gives service providers who innovate and personalize their discounts an opportunity to engage and convert customers. Research from Clutch, a multiservice IT firm, shows that the top reasons customers use e-commerce apps is access to deals (68 percent). Meanwhile, discounts on products similar to their past purchases is what consumers want most (85 percent). Findings from a RetailMeNot survey reinforce the intense appeal of discounts to consumers, and the utility of discounts to merchants. About two-thirds of consumers say that they make an unplanned purchase based on receiving a discount, and 74 percent say it is on their mind during the shopping process. What charge is the discount applied to? Let's say a customer buys a subscription product that costs $10 per month with a one-year commitment, and is given a coupon that entitles him or her to a 10 percent discount, resulting in a $9/month price point. What happens if, in the middle of the year, the price is raised from $10 a month to $15 a month? Does the discount stay at $1 off the standard price, or will it now increase to $1.50? What if, instead of a percentage discount, the customers receive a flat $1-a-month discount? If the price rises to $15, the user proportionally "loses out" on the discount because the net is a $1 discount on a $15 subscription instead of a $1 discount on a $10 subscription. Now imagine this scenario: After six months, the same merchant offers all customers 20 percent off of their current pricing on the condition that they commit for another 12 months. Is that 20 percent discount applied to the $10 standard fee — in which case the monthly payment will go down to $8 — or is it applied to the already discounted $9 per month fee, in which case the monthly goes down to $7.20? Discounts are a subscription service's best friend. How long is a discount coupon valid? Here's another complicating factor: How long does a sale last? There are many options here. Subscription services can create a discount that is valid for any specific time period, like indefinite new customer deals and seasonal sales. Discounts for referrals can be offered year-round, while other time-sensitive initiatives (revolving around a new product or service, or sale days like Black Friday) will limit the time frame, but increase the urgency. Who or what is entitled to the discount? Product discount. As in the examples above, a dollar value or percentage discount is applied to a purchased product or service. Across the board discount. In this case, everyone gets a discount on the total sum they spend, irrespective of the products that are purchased. Personal discount. This type of discount entitles only the coupon holder and no one else to a discount on everything they buy. Are discounts really only about money? In this context, a "discount" is really another word for a benefit. Money is only one dimension of the value that discounts can offer. Customers can also benefit by extending memberships for an extra month at no cost, by receiving loyalty points, earning free two-day shipping on a future purchase, and so on. Merchants hang brightly colored signs to advertise discounts, which are applied directly at the register. In the digital world, discounts are typically provided through discount codes that are generated and distributed via electronic and printed media. To track the success of large campaigns, and to meet demand, merchants often need to generate literally millions of discount codes on the fly. Imagine a competing subscription service catches you unaware and launches a new campaign that threatens to inflict considerable damage to your business. Do you have the means to be responsive and proactive? To compete successfully, you need to be able to hit back fast with a matching campaign in size and gusto. Therefore, merchants and service providers must have the ability to create new pricing within minutes and generate millions of coupon codes to support the campaign without being dependent on either third-party vendors or lengthy IT processes. This blog post opened by stating the obvious – that discounts are the oldest tool in the merchant's bag. Yet it ends with the reality that there are many different ways to apply discounts. There's no one "right strategy"– the best approach depends on numerous factors specific to a given business, its goals and its customers. But there is one constant that applies in all cases: Subscription businesses need maximal flexibility with their discount strategies to drive customer acquisition, sales and profitability. They need the capability to experiment and iterate with all manner of discount types. They also need a data-informed solution to help them analyze pricing and sales intelligence to identify the most effective types of discounts for each potential buyer, or type of product. Learning buyer habits and your prospects' preferences will help you propel your sales to new heights. Vindicia CashBox offers many different types of discounts – including those mentioned above and more. Our platform empowers merchants to experiment and iterate with their pricing and discounting strategies. Plus, our Client Business Reviews, reports and analytics tools help merchants identify the optimal pricing packages and discount strategy to maximize sales.